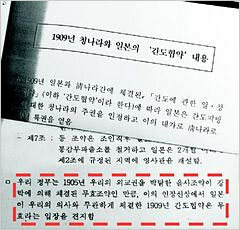 An underlined phrase in text submitted for parliamentary inspection states the Korean government's position that the 1909 Gando Convention, signed by Japan without Korea's consent, and the Eulsa Treaty, which deprived Korea of diplomatic rights in 1905, are null and void. It has been revealed that the Korean government is taking the position that the 1909 Gando Convention, signed between China and Japan, is null and void. The Ministry of Foreign Affairs and Trade revealed this government position in parliamentary inspection materials distributed to lawmakers on Tuesday, sparking concerns of diplomatic friction with China. This is the first time the government has revealed its official position on the matter. The Gando Convention was a treaty in which Japan handed over the Gando region, which was virtually Korean territory, to China in return for certain privileges in Manchuria, including railway concessions. If the Gando Convention were considered null and void, the government would be adopting a position that the region north of Mt. Baekdu and Tumen River was Korean territory. On page 186 of volume 7 of the Foreign Ministry's "National Assembly Inspection Materials," a copy of which was obtained by the Chosun Ilbo, the contents of the 1909 Gando Convention were explained, after which it said the agreement was null and void. In this section, it said, "Our government takes the position that the 1909 Gando Convention, signed by Japan without concern for Korea's position, is null and void, to the extent that the Eulsa Treaty, which deprived Korea of its diplomatic rights in 1905, is a null-and-void treaty obtained through duress." The Foreign Ministry distributed the materials during parliamentary inspections on Oct. 5. Out of concern that the materials might cause diplomatic friction with China, however, the ministry decided to collect all the material packets on the same day, sending ministry staff to the National Assembly with new material packets in which the section on the Gando Convention had been deleted. About this, a government official said, "It is our firm position that the Gando Convention is null and void, but taking into account how China has been reacting sensitively to the Gando Convention issue, even in relation to the Koguryo history issue, we've decided not to reveal that position to the outside." Ahead of this, the only position that had been revealed on this was that Foreign Minister Ban Ki-Moon revealed in an interview last month in which he said, "The Gando issue is a complex and sensitive one involving several countries, including North Korea, and as such, we must treat it carefully against a background of historical inquiry and the research results of experts."